A combination of depth, diversity, quality and value leads us to believe emerging market corporate debt offers a persuasive investment opportunity in its own right. 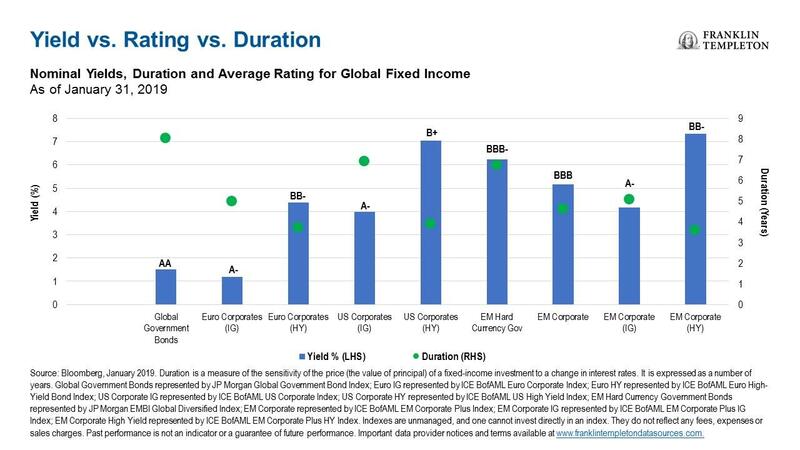 Emerging market corporate credit offers what we think is a compelling combination of nominal yield, low duration and high quality. Overall though, evidence would suggest there is no need to be more concerned about defaults in emerging market corporates than one would be about US or European corporates. Robert Nelson, a portfolio manager with Franklin Templeton Fixed Income Group, believes emerging market corporate debt presents a compelling but under-appreciated investment story. Here he sets out three reasons why investors might consider an allocation to the asset class. Emerging market corporate debt is a large and well-diversified asset class of higher quality than many people realize. Valuations have improved and we think there are attractive yields on offer in what we consider a misunderstood part of the fixed income world. Furthermore, correlations with other asset classes are such that emerging market corporates can greatly complement existing fixed income strategies, potentially helping to enhance returns while reducing overall volatility. With that in mind, here are three specific reasons to consider an emerging market corporate debt allocation. Emerging market corporate credit offers what we think is a compelling combination of nominal yield, low duration1 and high quality. For example, the nominal yield to worst of the BofAML Emerging Market Corporate Debt (EMCB) Index2 was 5.2% at the end of January 2019. Its average duration at the same time was low at 4.6 years. 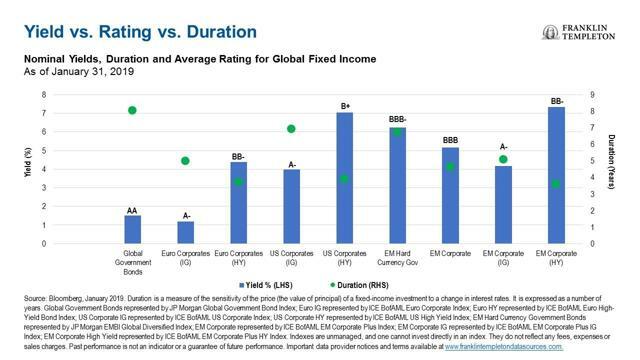 In addition, it may come as a surprise to many investors to learn 68% of the EMCB Index is investment-grade rated, which suggests to us that investors looking for quality income or carry without excessive duration risk might consider an allocation to emerging market corporates. 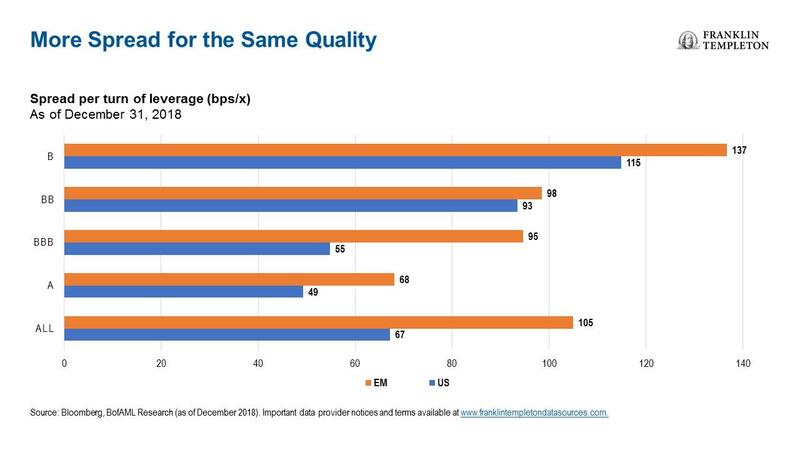 Emerging market corporates typically offer more spread for the same underlying quality than is the case for corporates in developed markets in general. This phenomenon is not only true at the index level, but in each ratings bucket, as the chart below shows. It illustrates the difference in spread per debt-to-EBITDA4 leverage multiple of emerging market and US corporate debt with the same rating. The additional spread compensates generously, we believe, for generic emerging market risk and shows the compelling relative value case for the asset class compared to developed-market credit. Investors are often surprised by the low rate of defaults among emerging market corporates. 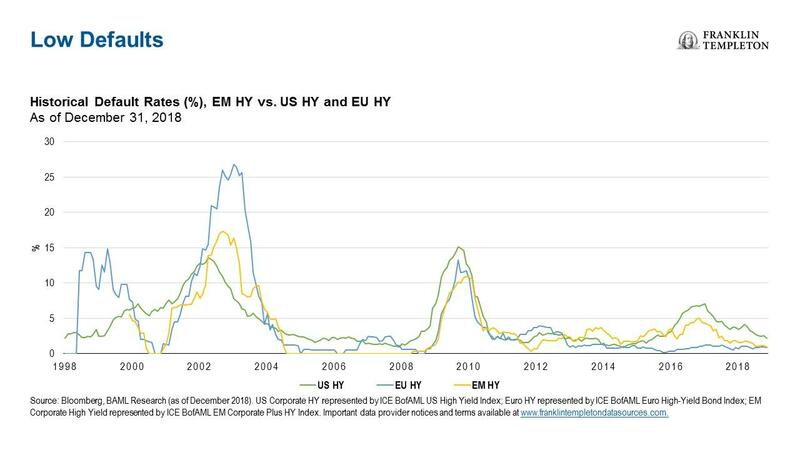 Historically, the rate of emerging market high-yield defaults is very similar to the levels among US and European counterparts. In fact, according to credit ratings agency Standard & Poor's (S&P), emerging market corporate defaults have been lower than US corporate defaults in 15 out of the 17 years to 2017. Crucially, in our view, throughout recent periods of volatility in some emerging markets, including Russia, Brazil, Ukraine, Argentina and Turkey, corporate defaults stayed well below 5%. We think this is a testament to the diversity of the companies whose bonds make up the asset class. Looking ahead, we expect emerging market high-yield default rates to likely remain in a percentage range of low- to mid-single digits. Our analysis shows emerging market corporate credit fundamentals are generally solid and the growth outlook remains positive in emerging markets, albeit lower than in previous years. There are of course pockets of vulnerability, which is why we think bottom-up research is vital, and the case for active management in emerging market corporates is particularly strong. All investments involve risks, including possible loss of principal. Special risks are associated with investing in foreign securities, including risks associated with political and economic developments, trading practices, availability of information, limited markets and currency exchange rate fluctuations and policies. Sovereign debt securities are subject to various risks in addition to those relating to debt securities and foreign securities generally, including, but not limited to, the risk that a governmental entity may be unwilling or unable to pay interest and repay principal on its sovereign debt. Higher-yielding, lower-rated corporate bonds are subject to increased risk of default and can potentially result in loss of principal. These securities carry a greater degree of credit risk relative to investment-grade securities. Investments in emerging markets, of which frontier markets are a subset, involve heightened risks related to the same factors, in addition to those associated with these markets' smaller size, lesser liquidity and lack of established legal, political, business and social frameworks to support securities markets. Because these frameworks are typically even less developed in frontier markets, as well as various factors including the increased potential for extreme price volatility, illiquidity, trade barriers and exchange controls, the risks associated with emerging markets are magnified in frontier markets. Bond prices generally move in the opposite direction of interest rates. Thus, as prices of bonds in an investment portfolio adjust to a rise in interest rates, the value of the portfolio may decline. 1. Duration is a measure of the sensitivity of the price (the value of principal) of a fixed-income investment to a change in interest rates. It is expressed as a number of years. 2. The ICE BofAML Emerging Markets Corporate Index tracks the performance of US dollar (USD) and Euro denominated emerging markets non-sovereign debt publicly issued within the major domestic and Eurobond markets. To qualify for inclusion in the index, the issuer of debt must have risk exposure to countries other than members of the FX G10 (US, Japan, New Zealand, Australia, Canada, Sweden, UK, Switzerland, Norway, and Euro Currency Members), all Western European countries, and territories of the US and Western European countries. Indexes are unmanaged, and one cannot invest directly in an index. They do not reflect any fees, expenses or sales charges. Past performance is not an indicator or a guarantee of future performance. 3. Source: JP Morgan EMBI Global Diversified Index as of January 31, 2019. 4. EBITDA stands for earnings before interest, taxes, depreciation and amortization. 5. Source: Bank of America Merrill Lynch as of December 31, 2018.